What’s all in a typical Abeka homeschool day? For Jamie and her daughters, it starts at 7:30 in the morning! Four years ago, Jamie and her husband came to me wanting to see how we homeschooled our children. They were considering pulling their girls out of the public school system. After much prayer and research, they decided that Abeka would be the best choice for their family. I have since returned the visit and I’m so glad I did! She and her lovely daughters shared with me how Abeka homeschool works for them. Whether you are considering using Abeka or have been using it for a while, you will find her experience helpful. It makes for a win-win-win situation. Aleah gets the help she needs from big sis; big sis will know it well because she is teaching; and Mom can quickly go throw a load of wash in the laundry! Aleah is in 3rd and Alysa is in 5th grade. Jamie daily uses the Progress Report Book that covers each of the elementary core subjects. Because Alexa is in 8th, she has a Progress Report Book for each of the core subjects. Each day she will cover Math, English, Science, and U.S. History. Bible is every other day. Current events are covered once a week. Any quizzes, tests and essays are sent in for Abeka instructors to grade. Jamie explained to me how she managed to juggle teaching all three grades her first year. Each of the girls has her own schoolroom in the basement of their home. One is at the end of the hall, while the other two are near each other in the same hall. There is one spot in the hallway where you can see inside each room. That is where Jamie camped out that year giving her full view of each of the children’s television screens! It allowed her to be available for the girls plus know what was going on in each classroom. 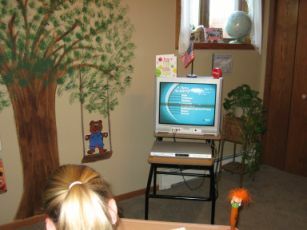 Because the girls each have their own room, they have the freedom to learn from their own homeschool DVD anytime, usually simultaneously. Here's Alysa in her room, viewing her DVD. I was able to get a peek at some of the work the girls were doing. They all have beautiful penmanship; one of many things Abeka takes pride in! Jamie showed me a page that Aleah had been working on for penmanship. I thought it looked great, each letter appeared to be formed perfectly. But Jamie thought her instructor would most likely give her a C. Not all of the letters were actually sitting on the line and a few letters were not written correctly. Abeka homeschool instructors use a very critical eye when it comes to correcting their students’ pages. That can be beneficial to the parent who has difficulty grading his child’s paper and still remain impartial.